Not all hydroponic systems are the same so as in the case of hydroponics nutrients. Read this post before choosing any nutrient pack for your growing plants in the hydroponic system. If you chose wrong nutrients this will result in loss of the plant. A step-by-step guide helps you to choose best hydroponic nutrients for your fruits and vegetables. In traditional growing, you are giving fertilizers to the plants by mixing them into the soil and in a hydroponic system, you are giving a nutrient solution to your plants to grow well. Plant roots directly come in contact with the nutrient-rich water to grow. It is not an easy job to grow plants without soil from without soil we mean in a hydroponic growing system. When you decide to grow plants in nutrient-rich solution then you should have complete knowledge of transforming normal water into nutrient-rich solution. Nutrients are the most basic need of plants in a system where you grow them without soil. They need more care than traditional growing methods but give more quality and pure products. Your nutrient solution should have the right composition of correct nutrients otherwise you will never get benefits of indoor growing. We are speaking all this from our own experience because we have a mid-size hydroponic garden in Brampton (Canada). Every other plant needs different composition of nutrients to grow healthy. While choosing nutrients ask yourself does it contains all the necessary nutrient in the right percentage which your plant needs to grow. Read the label of the product to know more or you can ask the experts. Read below and get the complete knowledge about hydroponic nutrients. Many experienced and new growers prefer to use pre-mixed nutrients as they are easy to use. All you need to do is dilute them by mixing with water to decrease the potency as they are highly concentrated. They usually come in 2 to 3 parts but some manufacturer prepares them into more parts so that growers can mix them according to the plant need. For needs are different for both seedling and vegetative stage. Many growers find problems with these nutrients as most of them are not designed for hydroponic system and those which are designed are not the complete food for plants. We have mentioned some of the excellent hydroponic nutrient brands you can use them anytime for better growth and more yield. These are specially made for hydroponic use. List of nutrients a hydroponic nutrient solution should have in it. Do not buy if any 2 or more below written nutrients are missing in the package. The ratio of these nutrients are different in brands but all of them are necessary for complete growth. Some big brands also mix micronutrients in their product which are not necessary to grow a plant but having them in the hydroponic nutrient solution is not bad. It does not matter you are using pre-made nutrients or mixing them together by yourself. You will face problems with them this is due to some reasons like. The nutrients are right but their power is too low to give full nourishment to the plants. Second is they are not mixed in the correct ratio and does not suitable for the plant you are growing. Thirds is nutrients are balanced and well mixed with high strength but still they did not work because of the weather condition. The environment is not suitable to use them. In most of the cases, nutrient mixtures are not complete because many beginners do not know about their plant needs and they just mix wrong nutrients by watching on the internet. Always gain complete knowledge about your plant because with hydroponic systems we grow unseasonal plants. This means we are growing summer plants in winter season but you have to give them everything like water and nutrient according to the plant type and nature (nothing with the season). This is also called controlled growing to visit our homepage to know more about indoor growing equipment. This is the part which most of the people neglect but you can save your dying plants if you know the symptoms of deficiency. Each and every mineral that your pants needs have its own impact on its growth and have own deficiency signs. To become a perfect grower, learn about them and give your plants exact needed nutrients. No need to read more books on plants signs and symptoms we have explained everything in this post in simple words. NITROGEN: leaves turn yellow in color and you observe improper growth or short growth. In this condition give your plants a high amount of nitrogen. PHOSPHORUS: The deficiency also put an effect on growth it actually slow down the growth. Leaves became dark green in color and sometimes little white or yellow lines appear on old leaves. POTASSIUM: If your lettuce is turning into yellow color or you see brown or yellow spots on plant leaves than this shows the deficiency of Potassium. This is the third main nutrient that plants need to grow. CALCIUM: The deficiency signs first appear on new leaves, the dark spots appear on them. Check the leaf tips if they show the sign of burn than this is the calcium deficiency. Blossom end rot of tomatoes also caused by it. If you are giving enough calcium than the problem is in the transportation of it to the plant. Use high-quality nutrients for your lovely plants. SULFUR: It affects the plant growth but usually sulfur deficiency is not common. MAGNESIUM: Another micronutrient essential for plants mainly for tomatoes. Veins appear in older leaves. ZINC: Common signs of reduction in the length of internode and leaf size. COPPER: Not common and its deficiency does not affect the plant. Normally every pant has enough of copper. IRON DEFICIENCY: This deficiency appears when there is a problem with uptake of iron. Visible veins on plant leaves. Well, it is best if you can create your own nutrient mixture because you are the person who is growing plants and understand them better. This also saves money and give you the full control over the nutrient dosage. But if you do not have enough knowledge about preparing hydroponic nutrients then please do not even think about it. The wrong mixture of nutrients will cause the death of your plant. In this case, it is highly recommended that you should buy them from the market and in case you are not finding them in the near market then go online and shop from Amazon. Usually, when you buy a branded nutrient product you will see something like 10-10-10 or 10-8-7. These numbers are there for a reason they show the quantity of Nitrogen. Phosphorus, Potassium. These three are the main ingredients that every pre-mix nutrient package has in it. Here 10-10-10 means all three are in the package 10% each and this total makes a 30 % of the nutrient bottle. The reaming 70% is water and other micro-nutrients which are good to have to make a complete plant food. The ratio will be different for different types of plants. Identify the nutrient deficiency signs and make a list which they need more and after that choose a product according to the signs and symptoms. The very first thing that you need to keep in mind before buying any nutrient solution is that they are specially designed for hydroponics. You cannot buy any ordinary nutrient pack and mix them together and put it into your hydroponic system. Try to avoid all-purpose packages which are made to use for soil and hydroponics. They are good but branded products and for them, you have pay high price. Soil fertilizers are different from hydroponic nutrient. For better absorption of nutrient select liquid hydroponic nutrient as they are easy to dissolve in water and are easily get absorbed by the plants. They do not contain heavy metals. First of all, check the growth stage of your plant than see the instruction guide given by the nutrient manufacturer to know the right mixing ratio. Now its time to add micronutrients like copper, zinc, boron etc. Now add nitrate nitrogen, phosphate, magnesium, stir well until they completely mix in the water. Mix phosphate, potassium, and sulfur together and add it into the water this is also called bloom hydroponics solution. At this point, you mix all the essential nutrients together for growth into the reservoir. It is time to check the acidic value of a solution. Check the Ph level of the solution, the recommended Ph level for hydroponics plants is between 5.5 to 6.5. anything above this will prevent the pants from absorbing added minerals. At last, point check the water temperature and maintain it between 60 to 70 degrees Fahrenheit. Are you tired of choosing different nutrients packs If yes, then choose this hydroponic nutrient pack by General Hydroponics. They made this nutrient basket to fill all your plant needs. Beginners do not know what type of ingredients to look in nutrients package due to the lack of knowledge. In this condition they can choose this go box, it contains every type of nutrients that you will need to grow your plants. Moreover, all the given nutrient bottles are made from pure organic elements. So, use them without worrying about the results because they are one of the best manufacturers of organic hydroponic nutrients. Instruction manual clearly shows how and when to use these best hydroponics nutrients. They make the manual in such a way so that the first-time users can easily understand and learn about the use of hydroponic nutrients. how to give nutrient to plants? What is the best way to use hydroponic nutrients? Etc. We find it very useful when we received it for the first time in July 2017. Always remember, whatever you are growing in your grow room you need best hydroponic nutrients otherwise you will get nothing at the end. Your plant will die because of a lack of nutrient supply. Nutrients are the everything that plants need to grow and develop fruits. As we Human beings need to eat healthy food for better health and life. Same way plants also need better food to grow and general hydroponics made this extraordinary pack of multiple nutrients solution to help you to grow your fruits, herbs, and vegetables healthy and disease free at affordable cost. Users find it very helpful because it contains all the biological plant foods and supplements which is available at a reasonable cost. If you buy all these separately this will increase the cost and hence increased production cost as well. Every grower wants to grow plants at the low production cost without compromising with quality. If you also think in the same way then you should try this amazing product. This will give you instant benefits by making your pants strong and disease-free in a few days. Now, what is inside the box? It has 10 oz bottles of BioThrive Grow and BioThrive Bloom fertilizers. 8 oz bottles of Biomarine, Biobud, Diamond black, Bioroot, CaMg+ nutrients. The advanced nutrient is a big name when it comes to the hydroponic nutrient supplies. The make all-natural fertilizers for plants. Use their products to increase your yield. This particular product has the highest positive feedbacks on Amazon. Buyers make it the best product for hydroponic systems. In the kit, you will get 3 pack nutrient solution. 1-litre Grow, Bloom, and micronutrients for vegetable and herbs. Use them according to your knowledge. Remember, best hydroponic nutrients can give the best growth. Do not buy the cheap product they claim to be organic and beneficial but in actual they are just wastage of money with many side effects. Experts advice use only those nutrients which are specially made for hydroponics Advanced nutrients organic fertilizer pack. Advanced nutrients design their nutrient pack in such a way so that you will get maximum absorption rate. We all know maximum absorption of nutrients means more harvest and low Ph level. Whenever you use fertilizers for plants always check for the PH level after giving them nutrients. A sudden increase in Ph level is normal but only for 3 to 5 minutes only after that it will automatically come at the normal level. In case the Ph level I not coming down put some more water this will dilute the nutrients and other plant supplements which results in low Ph readings. These nutrients bottles do not contain any heavy metal all are well-derived nutrients from organic components. Users say the plants are happy with this pack and Ph levels are also at normal same with the TDS level. The number of happy users shows the popularity of this brands over others. Advanced nutrients also have many other types of nutrient that you can use to grow different plants. Which you can check online on Amazon. Now here comes the natural nutrient booster. Botanicare pure blend tea compost is completely water soluble. It does not block the water intake pipes and get easily absorbed by the plants. This not only a liquid compost which is there it increases the absorption rate of nutrients. It also has some fantastic nutrients in it. Which gives excellent results in a few days of use. We would like to add some more information about the use of Botanicare green tea blend liquid compost. This plant supplement is better than ever before because now it has the mixture of very high-quality ingredients. 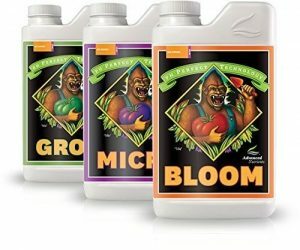 The manufacturer mixes the grow and bloom formula to make a single strong and effective method to grow plants. Use this liquid nutrient-rich compost in your hydroponic system to for better growth and more harvest. Premium organic elements make it extra strong and beneficial for indoor growing. All-natural formula is our favorite. It includes vitamins, fulvic acid, minerals, amino acids and different enzymes which speed up the nutrient absorption rate and growth. Go to Amazon for more detailed review. You will see the number of happy users that achieve desired growth and yield after using this amazing product. This is the top-selling Best hydroponic nutrients in the market. The ingredients and after results are very impressive which motivate others to buy this amazing nutrient package. Fox Farm is a trusted bend in the market they make many types of fertilizers and nutrients for indoor and outdoor plants. They give 2 bottles of nutrients and 1 bottle of fertilizer (in liquid form). The first one is Grow Big nutrient bottle which is best to use in the first stage of growth. This will increase the growth rate of pant and give disease free fruit. The second bottle is full of Tiger bloom. As the name suggests this is made to be used in the blooming stage when the plants show the first sign of flowering. This will increase the nutrient supply to the plant because it has everything for the blooming stage. The main active ingredient in tiger bloom is phosphorus. The last and the third bottle contains Big bloom hydroponic nutrients. Highly concentrated liquid for hydroponic plants use as per the instruction. Overdosage can damage the plant. FoxFarm said do not mix any other fertilizer or nutrient with their products because nobody knows what will be the result if you do so. Further, they said their products are a balanced formula by adding external substances you are changing the formula. Use all bottles in different stages do not use all of them at once. Read the label carefully to know exactly when to use which bottle of nutrients. For more info about their products visit their official website. Use this golden tree nutrient to increase the yield up to 20% and the best part is it has the capability to decrease the vegetative time by the 40 to 50%. Yes, this is true when we first saw this nutrient 2 years ago we did not believe on this. Since we are using this from 2 years now and have complete faith in the quality of this product. Our experts see a 40 % reduction in vegetative time every time we use this in our indoor hydroponic garden. It is high quality professionally made fertilizer which you can use in the hydroponic system, soil, lawns etc. growing medium does not affect the efficiency of the product. In fact, it is equally effective in all growing medium like soil and water when we test it in our greenhouse. Moreover, it is not a costly fertilizer use 16 ounces of it to make well balanced 250 gallons of fertilizer (highly concentrative). There no magic or tough science behind it working. Actually, it only does one thing better than other fertilizers and that is photosynthesis. Yes, it increases the photosynthesis process of plants which results in more growth enzymes which further leads to the fast growth up to 40 %. To see the magic of this product just add it to your plants and you will be surprised by the amazing results. Noticeable results will appear in just one week of use. Read the instructions carefully do not put overdosage this will result in permanent damage of plant. The manufacturer says this is not a complete nutrient product for plants use other essential nutrients along for maximum benefits.